Washington — The United States and the European Union targeted Vladimir Putin's inner circle with economic sanctions on Monday as Crimea moved to cement Russia's takeover of the breakaway Ukrainian region. Moscow and Washington have been on a collision course since last month's overthrow of Ukraine's former pro-Kremlin leader and US officials said the sanctions were the toughest since the Cold War. They had no immediate impact on the ground, however, where Crimea's pro-Moscow regional authorities busied themselves with preparations for their imminent return to the Russian fold. One day after a referendum -- rejected by Kiev and the West -- delivered a 96 percent vote in favor of Kremlin rule, they nationalized state energy assets and vowed to disband Ukrainian military units. Washington and Brussels had ample warning of the move, and acted quickly to slap economic sanctions on the senior Russian and Ukrainian officials seen as orchestrating the takeover. "We have been guided by a fundamental principle," US President Barack Obama said at the White House, a day after his latest call to his Russian counterpart Putin to urge restraint fell on deaf ears. "The future of Ukraine must be decided by the people of Ukraine. That means Ukraine's sovereignty and territorial integrity must be respected and international law must be upheld." The coordinated US-EU measures will freeze assets of key Russian presidential aides and lawmakers and target Crimean "separatist" leaders and ousted former Ukrainian president Viktor Yanukovcych. 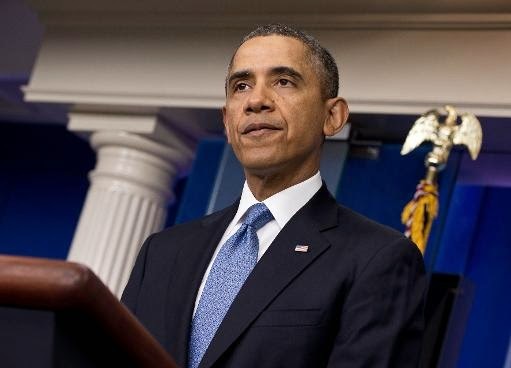 "If Russia continues to interfere in Ukraine, we stand ready to impose further sanctions," Obama said, adding that Vice President Joe Biden was heading to Europe to coordinate with allies. A senior US official said the moves were intended to strike at "people who are very close to President Putin." Another senior American official added: "These are by far the most comprehensive sanctions applied to Russia since the end of the Cold War, far and away." European Union Foreign Ministers also unveiled travel bans and asset freezes against 13 Russian officials and eight Ukrainian officials from Crimea. They did not identify those targeted, but US officials said the EU list would be announced publicly on Tuesday and would partially overlap with its own measures. UN Secretary General Ban Ki-moon said he was "deeply disappointed and concerned" about Sunday's vote. He warned a "deterioration of the situation will have serious repercussions for the people of Ukraine, the region and beyond." Obama, who spoke to Putin on Sunday, unveiled a new executive order, naming seven key Russian officials and four more from Ukraine and Crimea. Those targeted will see any assets and interests in the United States or under US jurisdiction blocked. They will not be allowed to do business with Americans and will find it difficult to make financial transactions using dollars. The high profile list of Putin acolytes includes Deputy Prime Minister Dmitry Rogozin who has branded US support for interim anti-Moscow Ukrainian leaders as a "circus." Senior US officials said the list of those sanctioned also included Vladislav Surkov and Sergei Glazyev, key aides to Putin and Duma members Leonid Slutsky, Yelena Mizulina. Federation Council members Andrei Klishas and Valentina Matviyenko are also targeted. Rogozin -- a former Moscow envoy to NATO who is known for his hawkish views of the West -- ridiculed the US maneuvres. "I think some prankster prepared the draft of this act of the US President," Rogozin tweeted in English. Meanwhile, diplomats in Brussels said EU and Ukrainian leaders would on Friday sign the political portion of a landmark pact whose rejection by Yanukovych sparked protests that led to his fall. 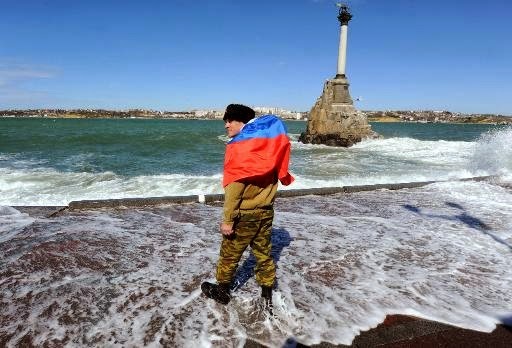 Most of the international community has rejected the Crimea referendum as illegal and Ukraine said it was recalling its ambassador to Moscow for consultations. 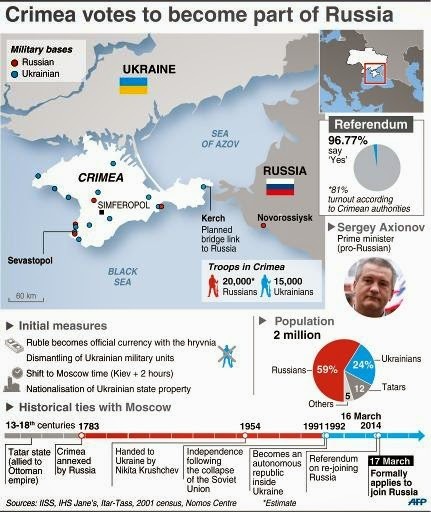 But the undaunted government of Crimea took several decisive steps aimed at permanently severing its ties with Kiev. It has begun seizing control of Ukrainian institutions and even plans to set the peninsula's clocks two hours forward to put it on Moscow time. Ukraine's interim president Oleksandr Turchynov denounced the vote as a "great farce" and watched from a podium as agitated lawmakers approved a partial mobilization of the army. Putin has claimed that ethnic Russians in Crimea and eastern Ukraine are under threat from "fascist" Ukrainian nationalists and has authority from his parliament to use force to defend them. On Tuesday, he will address Russia's two houses of parliament. Crimea's self-declared leader Aksyonov also said he was flying to Moscow Monday for talks. Russia's lower house of parliament is expected to debate legislation on Friday simplifying the process under which the Kremlin can annex another part of a sovereign state.